I’m always very excited by a book–especially a series–that offers something new, some new twist on the same old story lines. The paranormal market has been so saturated with the same, tired concepts that it’s a breath of fresh air to see something like the Arcadia Bell series. 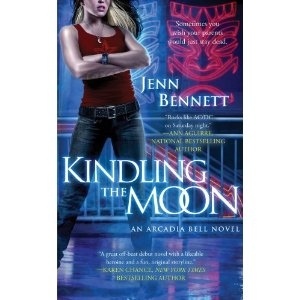 With the first title, Kindling the Moon, it’s obvious that this is going to be somewhat different. We may see the same genre details and the same types of characters that make paranormal fiction great, but Bennett does a really good job of being original with the themes and plot. “Being the spawn of two infamous occultists (and alleged murderers) isn’t easy, but freewheeling magician Arcadia “Cady” Bell knows how to make the best of a crummy situation. After hiding out for seven years, she’s carved an incognito niche for herself slinging drinks at the demon-friendly Tambuku Tiki Lounge. The series kicks off with book one, which is available now, and follows up with several more titles in the series. Posted on April 4, 2014, in Uncategorized and tagged Arcadia Bell, ebook, ebook review, fiction, Jenn Bennett, Kindling the Moon, paranormal romance. Bookmark the permalink. Leave a comment.